This is a Dual Mode Viaccess Orca CW64 Cam: manufactured by Neotion and fully licensed. Please note this cam is FULLY compatible with the new CW64 Encryption as implemented by Dorcel TV on Astra as of July 2017. Furthermore this cam is fully backwards compatible with other Viaccess Services. Using the latest Neotion Chipset, this Viaccess Cam is fully compliant to secure specification ACS 3.x being implemented by broadcasters such as BIS TV as well as being fully backwards compatible with existing Viaccess Cam Services. 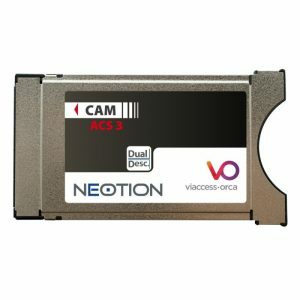 This Viaccess cam is suitable for all viaccess viewing cards sold by us & suitable for reception of MPEG2 & MPEG4, standard definition and high definition transmissions.